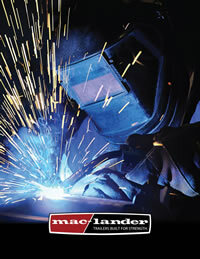 Mac-Lander, Inc. has established itself in the flatbed equipment/utility market. A successful dealer network is functioning throughout the country as a basis to our expanding marketing program. Our Mac-Lander flatbed trailers are engineered for strength and provide excellent sales potential to the commercial trailer industry. Mac-Lander trailers were founded on quality and this tradition continues by setting a new standard for the production trailer. Member of the National Association of Trailer Manufacturers, (NATM). All trailers meet or exceed all NATM guidelines. All trailers meet DOT specifications. Check out our testimonial page to see what others are saying about the Mac-Lander flatbed trailers. Our flatbed trailers are available immediately from manufactured stock supplies. We also stock a substantial line of repair parts for your flat-bed trailer when the need arises. More information is available from the Mac-Lander factory or your nearest dealer.